Yesterday’s two top division clashes turned out to be titanic duels which ended with the sharing of spoils. 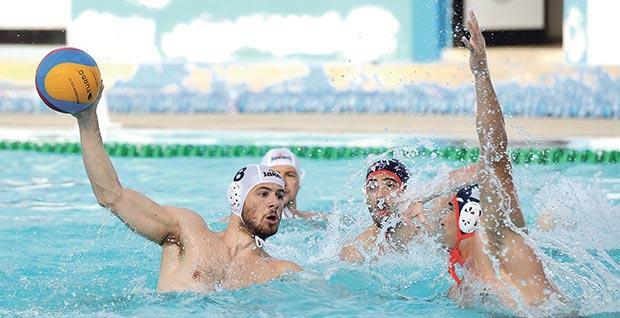 The match between San Ġiljan Salini Resort and Sliema Betsson produced waterpolo at its best to leave those present with their hearts in their mouths. The mixed recipe included goals galore, shifting of fortunes and all-out endeavour and tactical skills. The result was no miscarriage of justice as neither team deserved to finish on the losing side, given the commitment of both sets of players. The teams’ game-plan was mainly based on all-pitch press with intelligent shifting of the ball along the deeper edges of the players’ forward thrusts. It was perfect equilibrium all along as was also evident in the scoring rate statistics for both sides, with San Ġiljan netting four on eight while Sliema responded with four on nine. The lead alternated early on with Sliema twice falling two goals adrift before they drew level each time. Clint Mercieca, scorer of a hat-trick for the Saints, and Jerome Gabarretta and Marko Cuk for the Blues with four each, were the scoring protagonists. In the last session the Saints, though depleted after Aurelien Cousin and Matthew Zammit had been fouled out, again managed to open a two-goal lead before Cuk and Edward Aquilina’s last goal with 14 seconds to go restored the balance. A resilient Sirens Ritter Sport refused to buckle against the more quoted Neptunes Grimaldi, holding the Reds to a nine-all draw. Not only, but they were denied victory 12 seconds from time when the promising Jeremy Abela flicked in the Reds’ equaliser. It was tight all the way with first one team and then the other nosing ahead. Midway in the third quarter Steve Camilleri seemed to have tilted the balance Neptunes’ way when giving his team a 7-5 lead, the last goal being one of his typical class acts. However, Sirens captain David Cutajar also produced three salvos to put his side 9-8 ahead with two minutes left. Then came the final episode which saved the Reds’ faces. Sirens had been clinical when netting five on nine extra-man sets, with Neptunes managing one on six. Their attacking ploys were hampered by too much crowding in the centre which gave Cosmin Radu little room for a pot at goal, aside of Sirens’ robust shadowing. In the First Division, Marsaxlokk Fischer surprised champions Marsascala Nutrition Empire when defeating them 12-9 largely thanks to a 5-1 second session thrust and Christian Gialanze’s four goals. The result may well have a bearing on the destination of the First Division championship even if the four-round competition is in its early stages. Marsaxlokk were full worth their victory over their southern rivals as they showed better skills and applied the right tactics to nullify their opponents. San Giljan: J. Sammut, P. Borg 1, A. Galea, B. Vapenski 2, D. Zammit, M. Zammit 2, K. Galea, C. Mercieca 3, B. Plumpton, A. Cousin 1, P. Fava, Dino Zammit 2, D. Camilleri. Sliema: R. Coleiro, J. Gabarretta 4, E. Aquilina 2, C. Cluett, M. Meli, J. Soler, K. Dowling, T. Sullivan, J. Brownrigg, A. Attard 1, M. Cuk 4, N. Bugelli, Z. Sciberras. Referees: M. Dalli, F. Brasiliano. Neptunes: A. Borg Cole, N. Lanzon 2, C. Radu 1, K. Erdogan, T. Agius 1, M. Lanzon, S. Camilleri 3, J. Camilleri, J. Abela 2, M. Zammit, B. Lanzon, M. Azzopardi, M. Castillo. Sirens: N. Grixti, Z. Mizzi 2, S. Mora 2, G. Pace, M. Grech 2, I. Riolo, M. Balucci, D. Cutajar 3, J. Napier, J. Sciberras, L. Caruana, N. Farrugia, J. Cremona. Referees: A. DeRaffaele, M. Cataldi. Marsascala N. Empire: K. Schembri, J.C. Cutajar 1, J. Busuttil, C. Bonello 2, J. Bajada, L. Grixti, G. Kovacs 3, J. Cremona 1, S. Micallef, M. Pace 1, D. Cassar, O. Zammit, B. Dougall. Marsaxlokk Fischer: D. Abela, C. Spiteri de Barro 1, L. Calleja, K. Galea, C. Gialanze 4, C. Bugeja, S. Meli 2, I. Basara 1, B. Buhagiar 3, R. Scerri 1, K. Navarro, G. Busuttil, A. Xuereb. Referees: R. Spiteri, F. Brasiliano.